We are told that progress requires human beings to be connected, and that science, medicine and much else that is good demands the kind massive data collection only possible if every thing and person are continuously connected. But connection, and the continuous surveillance that connection makes possible, usher in an era of neocolonial appropriation. In this new era, social life becomes a direct input to capitalist production, and data – the data collected and processed when we are connected – is the means for this transformation. Hence the need to start counting the costs of connection. Capturing and processing social data is today handled by an emerging social quantification sector. We are familiar with its leading players, from Acxiom to Equifax, from Facebook to Uber. Together, they ensure the regular and seemingly natural conversion of daily life into a stream of data that can be appropriated for value. This stream is extracted from sensors embedded in bodies and objects, and from the traces left by human interaction online. The result is a new social order based on continuous tracking, and offering unprecedented new opportunities for social discrimination and behavioral influence. This order has disturbing consequences for freedom, justice and power — indeed, for the quality of human life. The true violence of this order is best understood through the history of colonialism. But because we assume that colonialism has been replaced by advanced capitalism, we often miss the connection. The concept of data colonialism can thus be used to trace continuities from colonialism’s historic appropriation of territories and material resources to the datafication of everyday life today. While the modes, intensities, scales and contexts of dispossession have changed, the underlying function remains the same: to acquire resources from which economic value can be extracted. In data colonialism, data is appropriated through a new type of social relation: data relations. We are living through a time when the organization of capital and the configurations of power are changing dramatically because of this contemporary form of social relation. Data colonialism justifies what it does as an advance in scientific knowledge, personalized marketing, or rational management, just as historic colonialism claimed a civilizing mission. Data colonialism is global, dominated by powerful forces in East and West, in the USA and China. The result is a world where, wherever we are connected, we are colonized by data. Where is data colonialism heading in the long term? Just as historical colonialism paved the way for industrial capitalism, data colonialism is paving the way for a new stage of capitalism whose outlines we only partly see: the capitalization of life without limit. There will be no part of human life, no layer of experience, that is not extractable for economic value. Human life will be there for mining by corporations without reserve as governments look on appreciatively. This process of capitalization will be the foundation for a highly unequal new social arrangement, a social order that is deeply incompatible with human freedom and autonomy. But resistance is still possible, drawing on past and present decolonial struggles, as well as the on the best of the humanities, philosophy, political economy, information and social science. The goal is to name what is happening and imagine better ways of living together without the exploitation on which today’s models of ‘connection’ are founded. The Costs of Connection will be published in Summer of 2019 by Stanford University Press. Pre-order the book here. A profound exploration of how the ceaseless extraction of information about our intimate lives is remaking both global markets and our very selves. The Costs of Connection represents an enormous step forward in our collective understanding of capitalism’s current stage, a stage in which the final colonial input is the raw data of human life. Challenging, urgent and bracingly original. Couldry and Mejias have written a profoundly important book, demonstrating the lasting value of social theory to the interpretation (and improvement) of our new digital reality. They deeply understand the nature of platform capitalism. 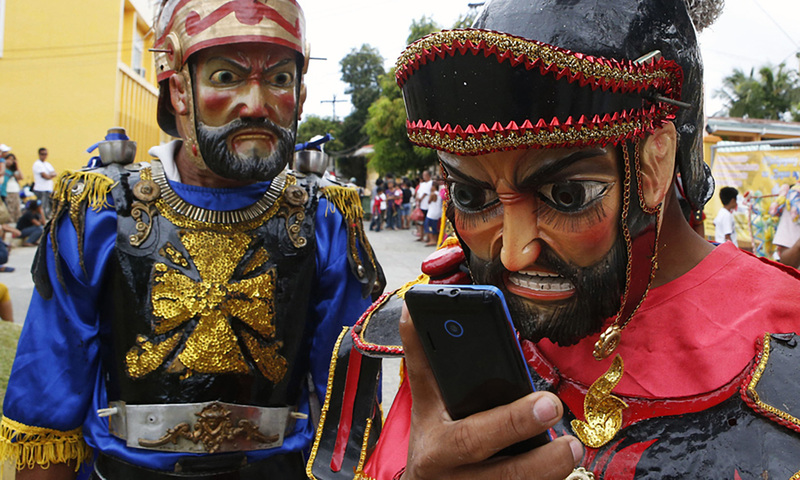 They draw striking and rigorously reasoned parallels between modern tech giants and the firms and governments that exploited colonies in centuries past. And they advance an agenda for decolonizing data that promotes a healthier ecology of online interaction. This book is an essential guide to understanding the depths of the crises in data protection, privacy, and automation that we now face. A provocative tour-de-force. A powerful interrogation of the power of data in our networked age. 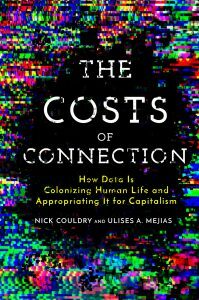 Through an enchanting critique of different aspects of our data soaked society, Couldry and Mejias invite the reader to reconsider their assumptions about the moral, political, and economic order that makes data-driven technologies possible. This book is among the most insightful and important contributions to our understanding of the political economy of data and the ‘internet of things.’ It brings together historical analysis, critical theory, and a trenchant sense of urgency to reveal what’s really at stake as we choose to send information through everything and connect our bodies and minds to streams of data. This book is a must-read for those grappling with how the global data economy reproduces long-standing social injustice, and what must be done to counter this phenomenon. With a feast of insights embedded in visceral historical and contemporary illustrations, the authors brilliantly push the reader to rethink the relations between technology, power, and inequality. There’s a land grab occurring right now, and it’s for your data and your freedom: companies are not only surveilling you, they’re increasingly influencing and controlling your behavior. This paradigm-shifting book explains the new colonialism at the heart of modern computing, and serves as a needed wake-up call to everyone who cares about our future relationship with technology. This is a deeply critical engagement with the systems that enable ‘data colonialism’ to extend its reach into the past, present and future of human life itself. 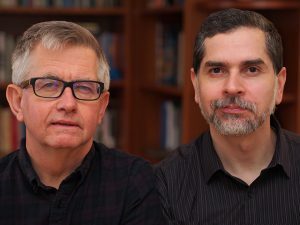 Couldry and Mejias provide a comprehensive and well-considered challenge to the seeming inevitability of this transformative development in capitalism. Theirs is a giant step forward along the path toward rediscovering the meaning and possibility of self-determination. It is not too late to join in! Couldry and Mejias show that data colonialism is not a metaphor. It is a process that expands many dark chapters of the past into our shiny new world of smartphones, smart TVs, and smart stores. This book rewards the reader with important historical context, fascinating examples, clear writing, and unexpected insights scattered throughout. —Joseph Turow, Robert Lewis Shayon Professor of Communication at the Annenberg School for Communication, University of Pennsylvania, author of The Aisles Have Eyes: How Retailers Track Your Shopping, Strip Your Privacy, and Define Your Power. Nick Couldry and Ulises A. Mejias go digging deeply into the digital: its spaces, its layers, its deployments. One guiding effort concerns what it actually takes to have this digital capacity in play. It is not an innocent event: it is in some ways closer to an extractive sector, and this means there is a price we pay for its existence. Nick Couldry is Professor of Media, Communications and Social Theory at the London School of Economics and Political Science. He is a sociologist of media and culture, who has also written widely on the ethics and philosophical implications of media. His work has extended these concerns into areas such as social media platforms and ‘real social analytics’. His most recent article is ‘Deconstructing Datafication’s Brave New World’ (with Jun Yu, LSE), published by New Media & Society in May 2018, which draws on their recent ‘Price of Connection’ funded research project. His last book The Mediated Construction of Reality (with Andreas Hepp, Polity, October 2016) won the German Communication Association’s biannual ‘theory’ prize. He is the author or editor of 12 books and more than 100 journals and book chapters, including Media Society World: Social Theory and Digital Media Practice (Polity 2012), Why Voice Matters (Sage 2010), Media Rituals: A Critical Approach(Routledge) and Inside Culture (Sage 2000). He is the joint Coordinating Lead Author of the chapter on Media and Communications for the International Panel on Social Progress (www.ipsp.org). He was Chair of the Department of Media and Communications at LSE from 2014-2017 and joint Head of the Department of Media and Communciatinos at Goldsmiths, University of London, 2010-2013. Ulises Alí Mejías is associate professor of Communication Studies and director of the Institute for Global Engagement at the State University of New York, College at Oswego. He is a media scholar whose work encompasses critical internet studies, network theory and science, philosophy and sociology of technology, and political economy of digital media. He is author of Off the Network: Disrupting the Digital World (University of Minnesota Press, 2013). In it, he develops his theories of nodocentrism (the exclusionary network logic that cannot render anything except nodes) and paranodality (the peripheral space, both inside and outside the network, which makes disidentification possible). Together, these concepts prepare the ground for decolonizing the internet by reframing ways of belonging to and differentiating the self and the collective from the network. He has also published various articles in top journals, including ‘Disinformation and the Media: The case of Russia and Ukraine’ in Media, Culture and Society (2017, with N. Vokuev), ‘Liberation Technology and the Arab Spring: From Utopia to Atopia and Beyond’ in Fibreculture (2012), ‘The Limits of Networks as Models for Organizing the Social’ in New Media and Society (2010), and ‘Sustainable Communicational Realities in the Age of Virtuality’ in Critical Studies in Media Communications (2001). He is the principal investigator in the Algorithm Observatory project.